Today’s review is the second book in Joelle Charbonneau’s “The Testing” series. If you missed the review of The Testing or my interview with Joelle Charbonneau last summer, please be sure to check them out when you have time. Joelle Charbonneau has just released the second book in her “The Testing” series. 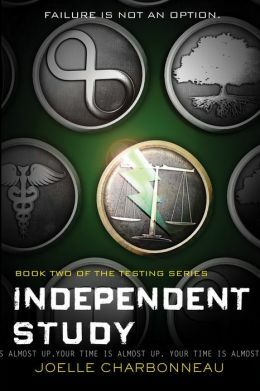 Titled, Independent Study, the young adult novel continues the story of Cia Vale as she struggles to find her place in a new dystopian world where it is not always easy to tell who the good people are. The middle book in a trilogy is fraught with troublesome problems for an author. Not only must the book continue the story set forth in the first book, but book two must also be able to stand on its own without giving away the ultimate endgame, which should arrive in book three. With Independent Study, Charbonneau rides this line with success. As the novel opens, Melencia Vale is coming to grips with the knowledge she was able to secretly deliver to herself at the end of The Testing. As she watches those around her who have no idea what the true costs of The Testing were, she continues to feel isolated – even from her boyfriend Tomas. She may not understand exactly what the United Commonwealth is up to, but she knows it does not feel right. Charbonneau makes the smart decision to start Independent Study with another round of testing for the students. In this case, they are taking a general aptitude test which will help to determine into which division they are placed for their University study. Those students who passed – survived – The Testing are surprised to learn that they are not the only students being accepted to University. There is also a group of students who did not have to participate in The Testing – and no one is surprised to learn that those students are from the Capitol. Although it is not what she wanted, Cia soon finds that the examination has assigned her to focus her studies in Government. She is disappointed with this decision but when she meets up with her mentor Michal, she begins to see that maybe this is the best place for her if she wishes to expose the corruption taking place in the higher echelons of the United Commonwealth. What follows are a series of challenges designed to be hazing type rituals where the older students can put the newbies through the paces. It is only once the students find out that there are a limited number of internship placements that things begin to take on more significant tone and the stakes become much higher. Everyone knows that the internships are the road to respect in the United Commonwealth. Especially since one of those intern positions is with President Anneline Collindar. Joelle Charbonneau keeps the tension high throughout the novel, reminding readers again and again, that no one is truly safe in this dystopian environment. Cliff-hanger chapter endings once again keep the pages turning quickly and by the time the reader reaches the end, they will be reaching out sweaty hands looking for the final book in “The Testing” series. The good news is that Graduation Day will be released in June, so the wait is not as long as it could be. Readers will just have to wait to see if Cia will be able to gain the confidence needed to expose the underbelly of corruption and save any of her family and friends who might be left. Thanks Salley. Once you get the hang of the comments box, it gets easier. Glad to hear that the links to previous content was useful. Happy Reading!